Goods that remain unsold at the end of an accounting period are known as closing stock. They are valued at the end of an accounting year and shown on the credit side of a trading account and the asset side of a balance sheet. Accounting and journal entry for closing stock is posted at the end of an accounting year. Closing stock is valued at cost or market value whichever is lower. It may be shown inside or outside a trial balance. Most often it is shown outside the trial balance. It is an important ingredient to calculate gross profit/loss and includes raw material, work in progress & finished goods. When closing stock is not shown in the trial balance. 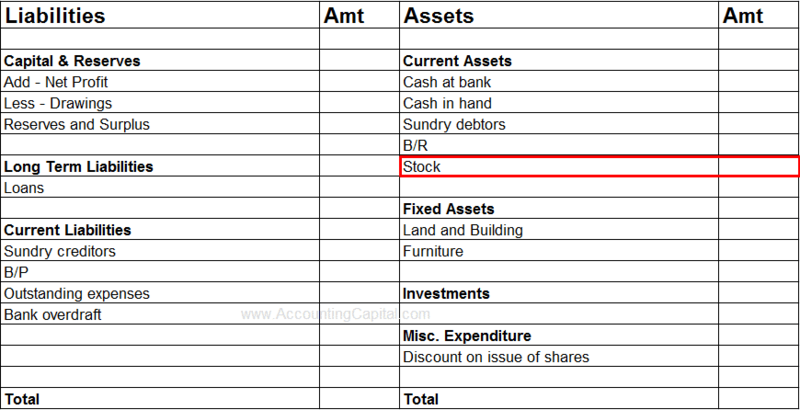 This is the most common scenario where the closing stock is not shown in the trial balance, it is only provided as additional information. It will be shown in the trading account & balance sheet. Below is the journal entry for closing stock in this case. 2. When closing stock is shown inside the trial balance. 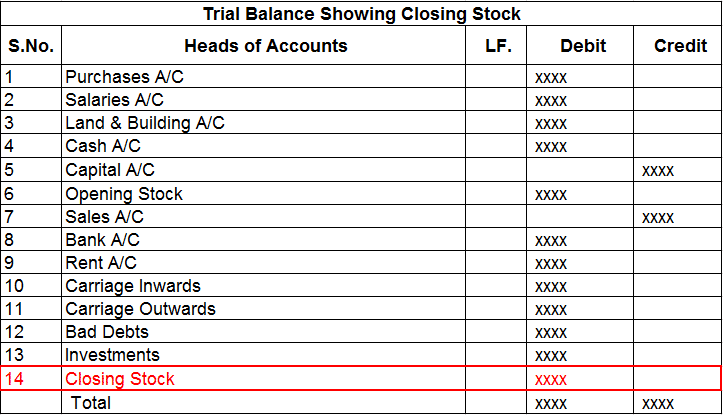 Uncommon, but a possible scenario where the closing stock is shown in the trial balance, it is only possible when the closing stock is already adjusted against purchases. Below is the journal entry for closing stock when it is reduced from purchases. In this case, it will be shown in the balance sheet but not in the trading account. >Read Why is Closing Stock Not Shown in Trial Balance?